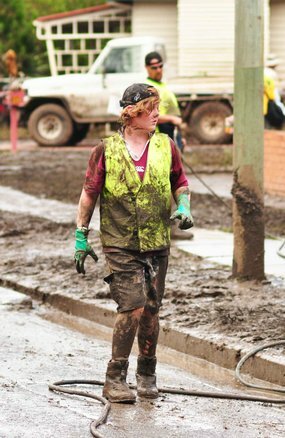 Thousands of volunteers around Brisbane and Ipswich have been praised for Saturday's tireless clean-up work as the cities continue mopping up after this week's devastating floods. More than 7,000 registered volunteers and many thousands of unofficial volunteers turned out for what Queensland Premier Anna Bligh labelled 'Operation Compassion' on an overcast but largely rain-free day in the state's capital. Brisbane Lord Mayor Campbell Newman said more than 11,500 people turned up at the four marshalling centres, joining 800 army personnel and 360 firefighters who were out hosing down the city. In Ipswich, more than 4,000 volunteers hit the streets alongside hundreds of soldiers and other emergency service workers as the city slowly regains some semblance of normalcy as shops are slowly restocking and roads like the Centenary Highway reopen. More than 3,000 homes and businesses in the city were underwater at the height of the flood on Wednesday, when the Bremer River hit 19.5 metres. Thousands of other unofficial volunteers simply roamed the city in utes and four-wheel drives - armed with gurneys, shovels, mops, buckets and other tools - stopping in wherever help was needed. Up to 50,000 people have registered to volunteer online. Prime Minister Julia Gillard said the volunteering effort showed tremendous 'Aussie spirit'. "Right across Queensland today people have got up, marched out of their homes and gone to find people to help," she said. "The scale of the volunteering is taking people's breaths away. To all of those people who are doing that today and doing it in the days to come, I salute you for your efforts." Ms Bligh said the the volunteer effort, which saw workers covered in mud from cleaning out the houses and businesses of friends and strangers alike, was remarkable. "We've got Operation Compassion happening in and out in just about every street and suburb that's had water in it," she said. 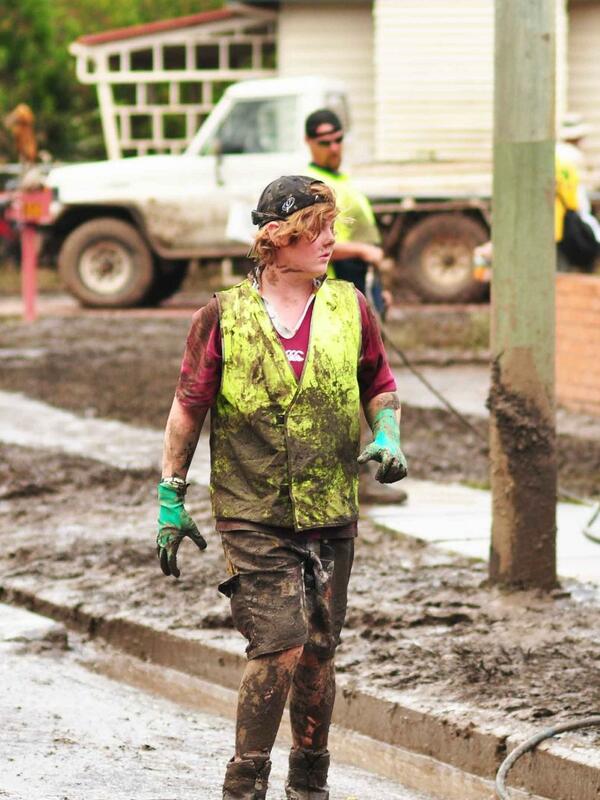 Chris Breen, from the flood-affected suburb of Oxley in Brisbane's west, was one local who took his ute out to help in the clean-up. He and a number of friends stopped at a street in Jindalee, also in the city's west, which had been inundated by floodwaters. In one street with about 20 houses, Mr Breen said there were around 100 volunteers lending a hand. "We spent a fair bit of time looking for houses that needed our help, because there were already so many people out there volunteering," he said. "We were firstly cleaning out the house with shovels and then hosing out the mud." He said what was most useful was the wheelbarrow and fridge trolley. "A lot of the houses were so messy to begin with that there were too many things to chuck out," he said. "But everyone just got on with the job, they just did what had to be done." Those working in the most devastated areas were covered in mud from shovelling muck or cleaning out houses, and many were shocked at the extent of the damage. "It's a bit like a war zone really," another volunteer said. "There's so much devastation, but everyone's just so good, everyone's just pitching in." Roads around the city have been gradually reopening - including the Bruce Highway running north from Brisbane to Cairns - allowing essential supplies to be restored to supermarket shelves. However Energex says around 23,000 houses are still without power, with outages knocking out mobile, internet and landline phone lines. Across the state 86 communities have been affected by flooding, with some towns deluged three times by floodwaters. The death toll in the south-east stands at 16, with the number of those missing revised down to 28. Grave fears, however, are held for 12 people still missing. Video SES engineers have given the all-clear to levees protecting the north-east Victorian town of Kerang as locals evacuate. Video Residents of the central Queensland city of Rockhampton have been caught out by flash flooding. Video North and south Sudan's new peace agreement will leave tens of thousands of bush fighters unemployed. 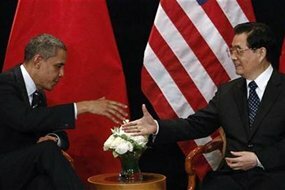 Video The Chinese president has arrived in Washington for economic and human rights discussions with his US counterpart. One community in flood-affected Queensland has managed to save its beloved bowles club. Fraudsters warned to think twice before dishonestly claiming special one-off payments designed to help flood victims. Michael Parkinson will be the first non-Australian to give the keynote address on Australia Day. Aussies are breaking the rules and opening up US iTunes accounts to get around the higher prices we pay in Australia.